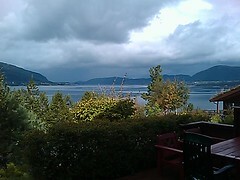 Norway, originally uploaded by ebygomm. Little cabin in the woods, originally uploaded by ebygomm. The Atlantic Road, originally uploaded by ebygomm. 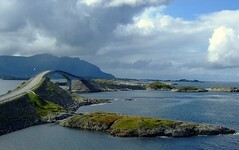 Eight bridges connect islands and islets at the ocean’s edge along the Atlantic Road. 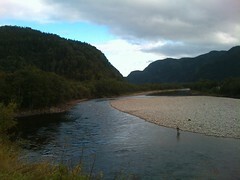 It was our destination for today, very beautiful even as we were being chased away by the rain. Hiding from the rain, originally uploaded by ebygomm. A leisurely 2pm start from Storlia under blue skies. Lots of rock, peat and heather as well as thousands of berries for trail side snacks. Round a lake, one river crossing, aided with a stick, numerous smaller ones. Then one final ascent before looking for a campsite. Find the perfect spot besides a small lake: soft ground, running water nearby and positioned to catch the last of the evening sun. Snow capped tops around a reminder that it summer is almost over. Bacon and smash for dinner then an early night. Cloud free skies greet us once again in the morning, our planned route is at a fairly relaxed pace so we enjoy bacon and pancakes before setting off. It’s virtually all downhill today so the going is easy. That is until we reach the marsh running along the bottom of the valley. Sections of boardwalk appear to have been placed at random so lots of trudging through mud. As we approach the innerdal hut the wind picks up and rain threatens. We make it to the hut just as the heavens open, remove our boots and enjoy a nice cup of tea inside in the warm and dry. As we watch the rainfall we decide that a night in the self service hut is just what we need, and we have the whole gammelhytta to ourselves and a room with a view. Day 3, originally uploaded by ebygomm. After a very pleasant night, just the 2 of us in a 30 bed hut we woke up to relentless rain. 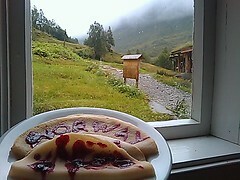 The previous day we’d gone all Ray Mears and collected berries to accompany our breakfast pancakes. Then donning full waterproofs we set off on the 4km trek to our collection point. Amazing waterfalls all along the way and easy going along a track, sharp contrast to yesterday and much more agreeable. 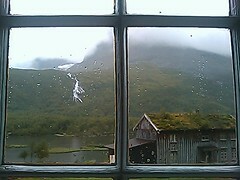 The rain never stopped and some hours later it’s still raining now we’re safely back in Eide. Fingers crossed the better weather forecast for the next days turns up.